As the composites manufacturing industry matures, there has been significantly more interest in companies spending the time to properly develop their design ideas as opposed to the more traditional “building it and see if it works” approach. This interest has been readily evident at the CIC as we have been increasingly approached by a diverse group of our industry partners to support both product development and the resolution of complex production issues. A recent review of the current ‘State of the Art’ engineering design tools has led to an update of our stand alone Computer Aided Design (CAD) and Finite Element Analysis (FEA) tools to an integrated capability. 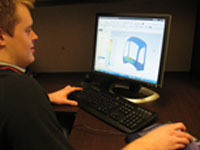 ‘Selection of the Siemens NX6’s integrated modeling, simulation and analysis package provides us with a much more efficient design and analysis process”, stated Mark Townsley, CIC’s Ground Transportation Projects Lead,’ these tools enable the designer to quickly change concepts and reassess them without transferring files between programs and having the potential for errors to creep in.” Other benefits include improved confidence that the analysis results are accurate with the mature solver, NASTRAN, being part of the system. The analysis of composite components is sometimes unreliable due the anisotropic nature of the materials which relates directly to how the solver processes their diverse properties. This new system will also speed up the manufacturing of prototype components as it provides the ability to model the drape of materials over complex shapes. This enables plies of material to be precut to fit properly in the mould prior to stepping on the manufacturing floor. The CIC looks forward to assisting our clients in improving their product design and development processes utilizing this enhanced capability.